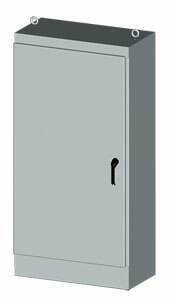 NEMA Type 3R &4 Free-Standing Outdoor Electrical Enclosures and Control Panels - Sizes from 60x24 to 90x36"
The SCE-FS Series electrical enclosure is designed to house a variety of electrical and electronic controls, equipment and instruments. Provisions for optional surface mounting or rack mounting of almost any type of equipment. Provides protection from dust, dirt, water and oil. The enclosures are extra deep for weatherproof applications requiring more interior space. These electrical cabinets are white powder coating inside and ANSI-61 recoatable gray finish outside over phosphatized surfaces. Stainless steel enclosures are Type 304 stainless with #4 brushed finish. Optional panels are powder coated white. To maintain NEMA Type 3R rating, a drip shield is recommended.